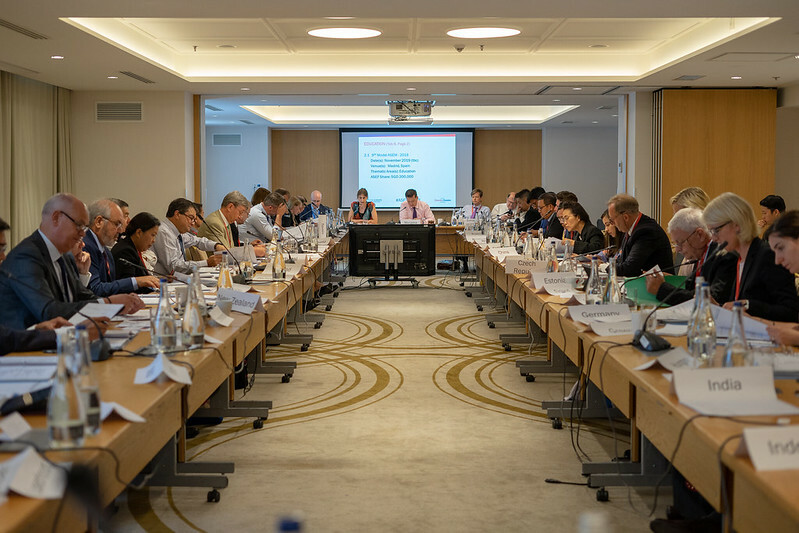 The Asia-Europe Foundation (ASEF) reviewed its achievements and examined its current policies and future activities at the 38th ASEF Board of Governors’ Meeting held on 7-8 June 2018. The meeting was graciously hosted by the Romanian Ministry of Foreign Affairs in Bucharest, Romania. "As an ASEF Governor from Asia, I'm delighted to attend and chair a Board Meeting in Europe," said Ambassador TUMUR Lkhagvadorj, the Chair of the ASEF Board of Governors for 2018. "ASEF's role in connecting Asia and Europe is reflected in all aspects of its work, particularly its various projects that bring together representatives of civil society, government and the private sector from both regions. As an Ambassador of Mongolia, the country that hosted the 11th ASEM Summit (ASEM11) in 2016, I am especially glad to know that ASEF will again organise multiple activities as side events for this year's 12th ASEM Summit (ASEM12) in Brussels, like it did successfully in Ulaanbaatar 2 years ago." At the meeting, the Board of Governors elected Ambassador Kojiro SHIOJIRI, ASEF's Governor from Japan, as Vice-Chair of the Board of Governors for 2019. At the same time, Ms Kamila LINDSTRÖM, ASEF's Governor from Sweden, was elected as the new Executive Committee Member as well as Finance & Audit Committee Member. ASEF Executive Director, Ambassador Karsten WARNECKE said, "Having entered its 3rd decade, ASEF continues to actively promote people-to-people connectivity between Asia and Europe through diverse activities, with a particular focus on the civil society and youth." He thanked the ASEF Governors for their continued support to ASEF's work, which is "indispensable for the advancement of ASEF's mission as the only permanent institution of the ASEM Process". "After the successful completion of this Board Meeting, I look forward to the 2nd half of the year which will be highly enriching for the ASEF team because of our flagship projects in different focus areas, including those in conjunction with the upcoming ASEM Summit," said Amb. Warnecke. In addition, participants of the Board Meeting attended the International Conference on Higher Education in a Challenging World, held on 7 June 2018 at the Great Hall of the Carol I Central University Library. The conference featured as keynote speakers the Romanian Minister for Foreign Affairs H.E. Mr Teodor MELEȘCANU and the Secretary of State, Ministry of National Education of Romania, Mr Ioan Ștefan GROZA. 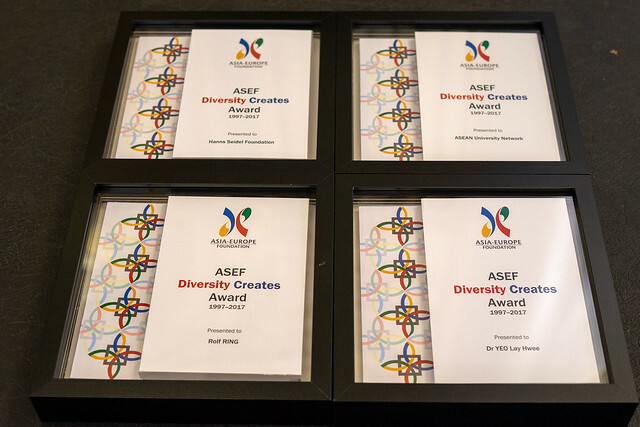 The 38th ASEF Board of Governors' Meeting was capped by a celebration of the winners of the inaugural ASEF Diversity Creates Award 1997-2017 with an award ceremony at the iconic Athenee Palace Hilton Hotel. The award honours individuals and institutions with an outstanding contribution to ASEF’s mission of promoting greater mutual understanding, civil society cooperation, and improving connectivity between the people of Asia and Europe. ASEF congratulates the following winners on their achievements: Dr YEO Lay Hwee (Singapore), Mr Rolf RING (Sweden), Hanns Seidel Foundation (Germany) and the ASEAN University Network.